To Sum It Up: Ruby’s world has been rocked by tragedy, but she can’t give in to her grief because she and her friends are still trapped in Los Angeles, surrounded by government forces who’ll show no mercy to any kid with psionic abilities. After a risky escape from the city, Ruby and her companions plan their next move: to free the kids still imprisoned in horrific “rehabilitation” camps. Ruby and her powers are at the center of the operation, one that will force her to confront her worst fears and possibly require her to make the biggest sacrifice of her life. I’ll cut straight to the single thing that I felt held In the Afterlight back a little: not enough Liam, Chubs, and Vida, especially not enough Liam. Let me explain myself. You can rest easy that these three are, indeed, in the book. I think my nitpick is a matter of personal preference, and I just wanted to see these characters make more appearances. I’m so used to Ruby going out on ops and witnessing the action firsthand, but in In the Afterlight, she sees more time at the makeshift headquarters. Liam, Chubs, and Vida go off on different missions and then return, with the action taking place off-page. After everything that this group, including Ruby, has endured together, I just would have liked to have seen an additional bonding moment or two. I’ve had the good fortune to read about some amazing, kickass heroines in 2014 (Heir of Fire’s Celaena Sardothien, Blue Lily, Lily Blue’s Blue Sargent), and Ruby easily falls into this category as well. What she’s been through—it breaks your heart when you sum up all of it. But she’s also survived; she’s demonstrated her strength time and time again, even when it seems like she should have nothing left to give. I mentioned before that Ruby isn’t a part of every op in the novel, but that’s not to say that she’s lolling around HQ. She’s grown into quite the leader, often discussing strategy with Cole, another Children’s League agent—and Liam’s older brother. Ruby also goes tête-à-tête with the reprehensible Clancy Gray, now the League’s prisoner, in the hopes of gleaning a clue to the whereabouts of his mother. Dr. Lillian Gray may not only know the cause of IANN, the disease that gave some children powers while killing others, but she may know how to cure it. Clancy won’t volunteer anything, of course, and a tense battle of the minds between him and Ruby plays out over the course of the book. I was absolutely riveted to the final third of In the Afterlight. I power read even through sleepy eyes because I could not go to sleep for the night without some small sense of resolution until the next time I could pick up the book again. The biggest op of Ruby’s life took a few years off of mine because my heart pounded in fear on her behalf. Everything that has happened in the previous two books has led up to this—and the moment is delivered brilliantly. I can’t tell you how many feels this series has given me, ranging from gut-twisting heartbreak to a severe case of melt-y heart every time Liam said “Darlin’.” This may be the end of the trilogy, but I’m not ready to let Liam, Ruby, Chubs, and Vida go. Nope, not ready at all. All in All: I feel a twinge of guilt for giving the series ender 4.5 stars instead of 5, but so much of the series for me has been about the chemistry between Ruby and her friends, and I just felt that it wasn’t as much at the forefront like it had been in the previous books. 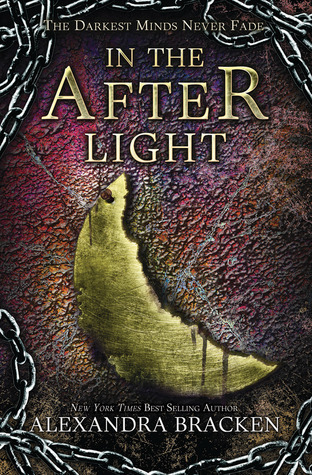 In the Afterlight was still a super good read, though, and obviously not to be missed if you’ve read The Darkest Minds and Never Fade. Darkest Minds is book 1? It's so cool that they put that up for FREE, naturally I grabbed a copy. I'm glad you grabbed a copy of The Darkest Minds! That was definitely a sweet freebie! And yes, that's the first book in the series.